buy a couple of more cupboards for the wall units but as we passed through the kitchen section this caught our eye. Last night the Pink Posies were here for their monthly card class and this table allowed me to keep from cluttering their tables. Of course it won't fix the problem of me picking up their scissors and walking away with them. However, I might have a solution for that. I will show you in an upcoming blog post. Now I'm off to order 3 packages of my favourite designer series paper and get 1 package for FREE. walking away with peoples stuff in a class - who ever would do that!!!!!! I just love this it looks fantastic and yes it does the trick. 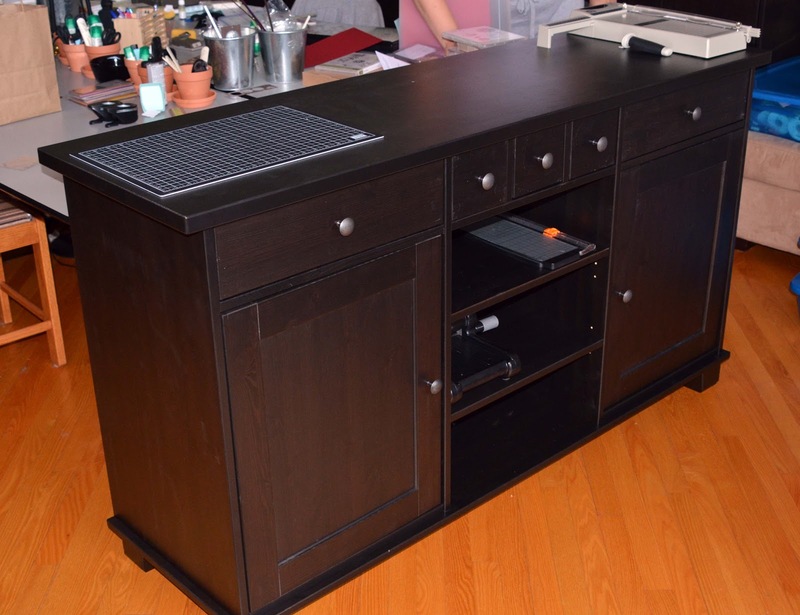 It has great storage as well as it is the perfect height as a work space easy on the back. I've loved this buffet since the first time I saw it. It is perfect for scrapping and I'm super happy for you that you've added it to your studio. It is the perfect addition!!! !